I’m writing a series of essays exploring the future of organisations from different perspectives: social, technical, philosophical and practical. 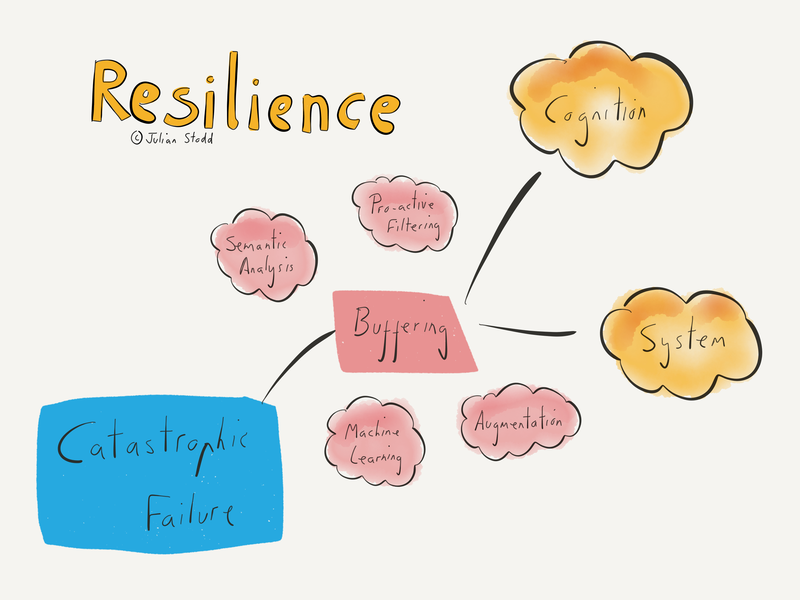 Today is another early stage #WorkingOutLoud piece as I think about resilience, specifically the ways that emergent technology may impact on individual cognition and catastrophic failure. Under pressure, we fail in predictable ways: we become more set in patterns of decision-making and action, fight or flight, less able to process new information, less able to hold as many things in our heads, less able to adapt. The failure we experience may be sudden and catastrophic not slow and incremental. In other words at the very point we may need to be most fluid and adaptive, we may become least able to do either of these things. Where does technology come into this? I recently introduced the notion of buffering: this is where emergent technology may be able to interface with individuals and social groups to prefilter information, to contextually provide different methods of interaction, to adapt to the pressure that the whole system is under. In technical systems, in complex machines, we build in redundancy: the notion that when something fails, there is a system dedicated to take over from it. Social systems work differently: as an individual level, we cognitively full-back on more primitive and less flexible subsystems, whilst other community level we cover for each other, with the strength of the group filling in the weakness of the individual. The system as a whole may appear to be robust, but only up to a point. We all know that the straw may break the camel’s back, but it can be remarkably difficult to spot which straw. There are already multiple research projects looking at how machines can read human emotions: everything from physiological signs, read through wearable EEGs, monitoring eye movement or other responses, through to signifiers of psychological stress such as individual words used or indeed a meta-analysis of conversations, such as the analysis of Twitter feeds to see if they have predictive power of social unrest. Organisations typically respond and communicate in predictable ways, but imagine if they could be adaptive in their response. Taking a temperature check of the system and responding accordingly. In high-pressure situations, such as disaster management, offer first response situations from emergency workers, there may be a benefit in the communications technology itself being able to gauge the pressure that the system is under. We are already seeing semantic analysis where systems are able to read multiple news sources and produce one clear and coherent account. Imagine one step beyond this where they can monitor communications and provide contextual access to support, learning, and resource situations unfold. Effectively imagine that the system brings the fire extinguisher to you, rather than you having to work out where the fire extinguisher is, and which colour extinguisher you should be using for a particular type of fire. Everyone is aware of emergent technologies, be it the initial reactions to Google Glass or excitement about the possibility of AI and machine learning. Wearable technology is already invading our ecosystem fast, and the age of distributed and interconnected computing is well upon us. I’m interested not about the separate strands of this development, but rather the convergence into one adapted ecosystem, and the ways that this may increase resilience. Monitoring individual pressure and adapting the feeds accordingly, measuring individual stress and providing contextual support, access to supportive community, and real-time contextualisation of inputs according to our ability to deal with it. Imagine communities enhanced by this ability: the organisation better able to respond under pressure will have a competitive advantage. And this may not be about single-point giant gains, but rather marginal wins that collectively make an organisation better adapted. 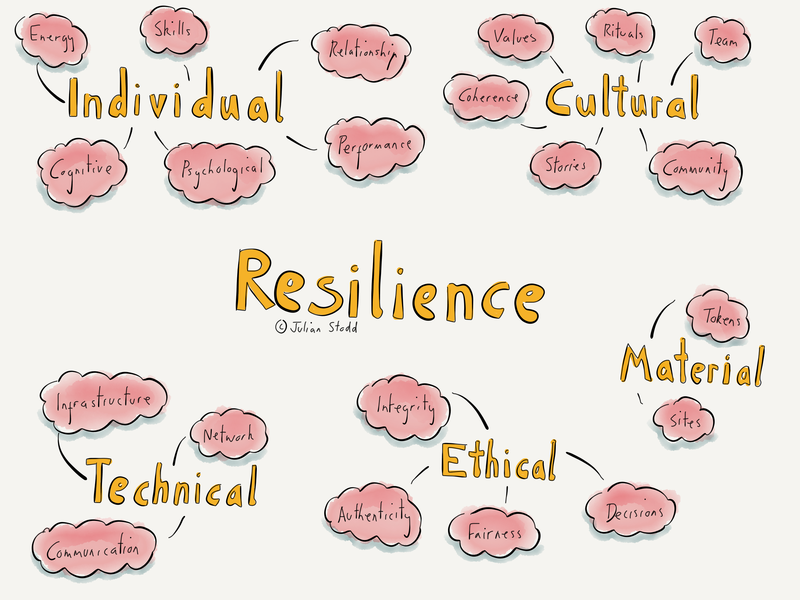 As I say, these are early-stage thoughts being shared as I work out loud exploring various aspects of the future state and the ways that it will impact on us as individuals, within our communities, upon our technology, and the nature of organisations themselves. The future may not be here yet, but plenty of organisations are interested in what the shape will be of things to come. And some of them are ensuring they get one step on the ladder early. This entry was posted in Future and tagged AI, Artificial Intelliegence, Augmented reality, Change, Future, Future of Work, Futurism, Machine Learning, Transformation, WorkingOutLoud. Bookmark the permalink.